Provincetown could get a lot busier for a whole new reason. Rooms and parking spaces may become harder to find this summer if Christian pilgrimages to the Toys of Eros store on Commercial Street so good Biblical families can get the equipment they need to go beyond thumping their Bibles and start thumping the ‘little woman” catch on. A new movement among fundamentalists Christians is “Spanking for Jesus”, formally known as Christian Domestic Discipline. This is an arrangement between husband and wife in which the husband dominates the wife by using divinely-approved spankings. Estimates are that thousands of couples have actually embraced the Christian Domestic Discipline life style. There are two websites that emphasize the absolute power of a husband over his wife because it is supposedly supported by biblical teachings. ChristianDomesticDiscipline.net says this type of marriage is “set up according to the guidelines set forth in the Holy Bible, meaning the husband has authority over his wife within the bounds of God’s Word and enforces that authority, if need be, through discipline including but not limited to spanking”. The other site, ChristianDomesticDiscipline.com, claims that such marriages are “simply a traditional, male-led, Christian marriage” in which “one partner is given authority over the other, and has the means to back up that authority, usually by spanking”. A “Beginner’s Packet” instructs husbands on how to best manipulate their wives with psychological tricks like withdrawing the privilege of going places with friends, and corporal punishment which includes spankings with a wooden paddle. Denying that the spankings are a form of domestic abuse, the wives who are in these marriages go along with it. “Most of the women who write about their CDD experiences online are not complaining. Many of them report feeling extremely calm and relaxed after being disciplined, and believe it is an expression of their husband caring about them and their marriage, enough to help them modify their behaviour [sic]”. However some experts, like Forensic psychologist Jim Alsdurf, view them as little more than the symptom of disturbed minds. 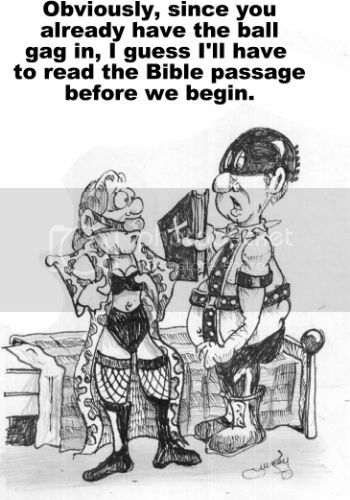 To him Christian Domestic Discipline seems to be more of an unhealthy and distorted way to fulfill a suppressed sexual desire as opposed a religious lifestyle. “No fool in his right mind would buy this as a legitimate way to have a relationship,” he said. “A relationship that infantilizes a woman is one that clearly draws a more pathological group of people”. Silent Meditation seems to becoming a little like Sado-Masochism. One has to wonder if there are certain required outfits.